We’d love your help. 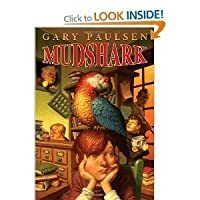 Let us know what’s wrong with this preview of Mudshark by Gary Paulsen. Mudshark is the go-to guy for any mysteries that need solving. Lost your shoe? Can’t find your homework? Ask Mudshark. That is, until the Psychic Parrot takes up residence in the school library and threatens to overturn Mudshark’s position as the guy who knows all the answers. The word in school is that the parrot can out-think Mudshark. And right now, the school needs som Mudshark is the go-to guy for any mysteries that need solving. Lost your shoe? Can’t find your homework? Ask Mudshark. That is, until the Psychic Parrot takes up residence in the school library and threatens to overturn Mudshark’s position as the guy who knows all the answers. The word in school is that the parrot can out-think Mudshark. And right now, the school needs someone who’s good at solving problems. There’s an escaped gerbil running rampant, an emergency in the faculty restroom, and all the erasers are disappearing from the classrooms. When Mudshark solves the mystery of who’s stealing the erasers, he discovers the culprit has the best of intentions. Now he has to think of a way to prevent the Psychic Parrot from revealing the eraser-thief’s identity. With a bit of misdirection and a lot of quick thinking, Mudshark restores order to the chaos . . . just for the moment. To ask other readers questions about Mudshark, please sign up. Do you know what the story is about? How many pages are on the book? Lyle Williams, nicknamed Mudshark by his classmates, is the go-to guy at school for finding lost items and solving small mysteries. His mind is always working....his memory is amazing. He can remember where he saw lost items and solve almost any mystery or problem. Pretty good for a 12-year old, eh? But he finds himself with a feathered rival when the school librarian gets a parrot. The parrot seems to be psychic. It can answer kids' questions about lost homework and misplaced books faster than Lyle Williams, nicknamed Mudshark by his classmates, is the go-to guy at school for finding lost items and solving small mysteries. His mind is always working....his memory is amazing. He can remember where he saw lost items and solve almost any mystery or problem. Pretty good for a 12-year old, eh? But he finds himself with a feathered rival when the school librarian gets a parrot. The parrot seems to be psychic. It can answer kids' questions about lost homework and misplaced books faster than Mudshark can. Rumors shoot around the school in lightning speed that the bird can out-think Mudshark. Will he lose his cool reputation at school? And, if he's being out manuvered by a bird who will find the escaped gerbil, solve the mystery of the faculty restroom and discover why erasers are disappearing from classrooms? Mudshark is on the case.....before he loses to a psychic parrot! Great writing. Just ... not much of a story. Does that make sense? "There are many ways to describe Ms. Underdorf. She was brilliant and joyous and she believed--probably correctly--that libraries contain the answers to all things, to everything, and that if you can't find the information you seek in the library, then such information probably does not exist in this or any parallel universe now or ever to be known. She was thoughtful an Great writing. Just ... not much of a story. Does that make sense? She was thoughtful and kind and she always believed the best of everybody. She was, above all else, a master librarian and knew where to find any book on any subject in the shortest possible time. 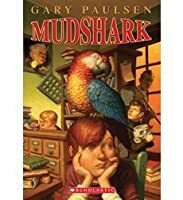 MUDSHARK is a great addition to any Gary Paulsen collection. It's not the HATCHET adventure type, but rather one of the crazy, mad-cap mishap stories like HOW ANGEL PETERSON GOT HIS NAME and LAWN BOY. Mudshark is actually Lyle Williams. He got his name for his lightning speed and his incredible observation skills. These are skills he honed while keeping an eye on Kara, Sara, and Tara, his triplet sisters. When they became mobile, life became one accident-avoidance after another. Most of Mudshark's skills are put to use helping his friends at school. He has a certain knack for finding anything that goes missing. The main adventure, in what I hope is Paulsen's first in a series of Mudshark adventures, is locating the school's mysteriously missing erasers. Yes, gradually every eraser in the school has disappeared. The cast of characters in MUDSHARK is quite colorful. There's a talking parrot in the library, an easily excitable English teacher, a culturally educated custodian, and a "free-range" gerbil, just to name a few. I especially enjoyed the principal's announcements that opened each chapter. His running commentary on some sort of out-of-control situation in the faculty restroom was a hoot! Aimed at an audience of 8-12 year olds, MUDSHARK is one of those fabulous Paulsen books that can be enjoyed by anyone from a beginning chapter book reader to a senior citizen who remembers what it's like to be a kid. At only 83 pages long, MUDSHARK is a quick way to pass the time and enjoy a laugh or two. Over the years Gary Paulsen has created some memorable characters, and twelve-year-old Lyle Williams (known to friends and admirers as Mudshark) may join the ranks of his fan favorites. Mudshark is the epitome of Joe Cool, owner of a dazzling logical mind that never misses a trick when he's on the trail of a mystery or missing object in the vicinity of his school. He's the only member of his family never outwitted or overwhelmed by his younger triplet sisters, Kara, Sara, and Tara, who are freq Over the years Gary Paulsen has created some memorable characters, and twelve-year-old Lyle Williams (known to friends and admirers as Mudshark) may join the ranks of his fan favorites. Mudshark is the epitome of Joe Cool, owner of a dazzling logical mind that never misses a trick when he's on the trail of a mystery or missing object in the vicinity of his school. He's the only member of his family never outwitted or overwhelmed by his younger triplet sisters, Kara, Sara, and Tara, who are frequently too much for their distracted parents to handle. Mudshark learned the value of education as a tiny child, fortifying his brain with every scrap of literature he could get his hands on at the library where his mother works, and that provided him a foundation of knowledge to inform his sleuthing capabilities. Whenever a kid or grownup at school needs a gumshoe, they put in a call to Mudshark, and he never fails to come through for them. It's a heck of an arrangement. Things seem to change when the school librarian brings in a talkative parrot as part of an initiative to introduce pets to the learning environment. The parrot proves to be faster than Mudshark at solving cases, and the novelty of a bird detective relegates Mudshark to second-in-command. Cool as Mudshark is, he's not pleased with his position being usurped, so he looks for a way to prove his superiority to the popularly acclaimed "psychic bird." What connection does the parrot have to the disturbingly dysfunctional faculty bathroom, the talents of kid magician Kyle Robertson, a fugitive gerbil in the school's halls and vent system, and the pilfering of blackboard erasers from every classroom in the building? With Mudshark and the cheeky parrot each on the case, answers are sure to surface eventually, but Mudshark's reputation depends on him figuring it out first. Can he find what links the ostensibly unrelated elements of the case together and arrive at an answer before his colorfully plumed rival? This review has been hidden because it contains spoilers. To view it, click here. I thought this book was pretty interesting. I really just grabbed it off the shelf and decided to give it a try. Lyle Williams was a quick thinker and great observer. He was also known in school as Mudshark. During the game of Death Ball he would hide in the mud and catch the runners’ ankles. He would do it so fast that high-speed cameras could not catch it. Therefore, that is why they called him Mudshark. Everyone would go to him if they had lost something or wanted to know details for an event. I thought this book was pretty interesting. I really just grabbed it off the shelf and decided to give it a try. Lyle Williams was a quick thinker and great observer. He was also known in school as Mudshark. During the game of Death Ball he would hide in the mud and catch the runners’ ankles. He would do it so fast that high-speed cameras could not catch it. Therefore, that is why they called him Mudshark. Everyone would go to him if they had lost something or wanted to know details for an event. Until one day when the librarian brought this special parrot to school. The parrot could give people information faster than Mudshark and was more observant around the school. Mudshark gets jealous of the parrot, which causes him to solve the ultimate mystery at his school. Which was where did all of the schools’ chalkboard erasers go? Mudshark finds them and gets honored by the principal to solve another school mystery. This book is told in third person point of view, following the life of Lyle Williams. Also known in the book as Mudshark. The Mudshark was cool. He didn’t know or think he was. He just was. Everyone knew he was the go to guy for answers, because of his fast thinking and ability to solve mysteries.“Mudshark” takes place all around Lyle Williams school in the twenty first century. Mostly in the schools’ library though. They have present day things like Smart Boards and walkie-talkies. I think the authors’ message in the book “Mudshark” is that you must go above and beyond to keep your title. If someone or something steals a title or name from you, you should do whatever it takes to get it back. Encouragement is a theme, because Mudshark is trying to prove he is better than the parrot. I would recommend this book to anyone in middle school or is going to be in middle school. The story has humor that fits that age group best. It was a pretty good book to read. In the novel "Mudshark" by Gary Paulsen, the main character is the kind of kid who everybody comes to when they need something solved. Mudshark continues with this role until a psychic parrot comes into the school and starts making Mudshark look bad. He is then put to the test to prove to himself that he is better than the parrot. I recommend this book to all kids in middle school and older, because it is an easy and fun book to read. 3.5 stars. 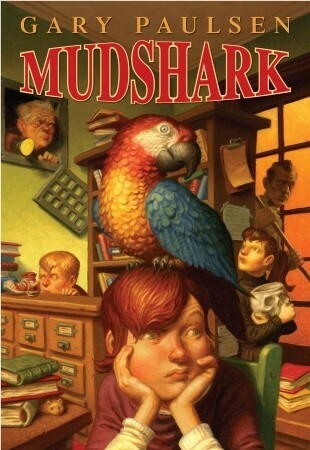 "Mudshark" is Paulsen's answer to "Harriet the Spy" meets "Joe Cool". I was a bit puzzled by the rogue parrot's intellectualization, but I liked the protagonist's comparative savvy. Each chapter begins with a broadcast from the principal's office, bellowing an update on several school happenings. The school's population is eccentric, but lovable. "Mudshark" was a fast read, and the characters' antics would be interesting to 9 to 11 year-olds. "Mudshark" is a great book for all kids at all reading levels because it is an easy and fast read. This book is a hard book to put down because once you start it you have to finish it. "Mudshark" is an easy book to follow and understand but at the same time makes you think. It also makes you put the pieces of the story together. The characters in "Mudshark" are mysterious and some are very funny. This book is a good book to just sit down and read on a rainy weekend. The characters were too oddball and random for me, so overall, I did not enjoy this book as much as other Gary Paulsen books. I think an upper elementary student would find this quick read humorous, but I thought the characters and events were either bizarre or boring. Very funny. Kids will love this and teachers reading it aloud will laugh as well. Heavy-handed and over the top. I much prefer Paulsen's memoirs and adventure books to his recent humorous MG books. Good book. It's very hilarious and mysterious, but a bit to short for me. I think people who like stories that are short and funny, then this book is for Y-O-U! Would be better if has some more adventure instead of just mysteries. Mudshark is the smartest kid in school, finding lost objects and solving mysteries for his classmates and teachers. When a psychic parrot takes up residence in the school library, Mudshark's detective agency is threatened, and he'll do anything to outsmart that talking bird. Between stolen chalkboard erasers, a missing gerbil, and a toxic situation in the faculty restrooms, Mudshark will have to think and scheme and plan to save his school! This story is hilarious, with weird and wacky characters Mudshark is the smartest kid in school, finding lost objects and solving mysteries for his classmates and teachers. When a psychic parrot takes up residence in the school library, Mudshark's detective agency is threatened, and he'll do anything to outsmart that talking bird. Between stolen chalkboard erasers, a missing gerbil, and a toxic situation in the faculty restrooms, Mudshark will have to think and scheme and plan to save his school! This story is hilarious, with weird and wacky characters, and a silly plot. Mudshark himself reminds me a little bit of Encyclopedia Brown, with a photographic memory and an eye for details. He's a puzzle solver, and has lightning-quick reflexes. The dialogue is silly, the characters are dorky and strange. I laughed my head off in every chapter! My heart went out to the principal of that school! The erasers are disappearing from classrooms, there's a gerbil on the lose, and the faculty bathroom needs to be relocated to Area 51. Can Mudshark, the most observant kid in the school, solve the mysteries, or will the librarian's new, psychic parrot put the Mudshark Detective Agency out of business? This book was funny. The images and situations Paulsen either described or hinted at were fantastic. My only complaint with the book was that all o My heart went out to the principal of that school! The erasers are disappearing from classrooms, there's a gerbil on the lose, and the faculty bathroom needs to be relocated to Area 51. Can Mudshark, the most observant kid in the school, solve the mysteries, or will the librarian's new, psychic parrot put the Mudshark Detective Agency out of business? 2.5 stars. I was not impressed with this one. Aaron is currently reading this for his English class. I felt it was too young for 11 and 12 year olds. This is something 4th graders should read. Lyle, aka Mudshark finds lost items. His ways are being challenged by the school's new pet parrot. Erasers have gone missing, all of them, and Mudshark is assigned the task of locating them. This was a vacation-assigned read, so perhaps that's why it seemed out of place. Very different from Hatchet. I would compare this to Frindle. It is a 6th grade reading level but I believe it could be enjoyed by younger audiences as well. Very clean which is always a plus i think dang is the worst word used. They do talk a bit about crayfish reproduction with crayfish mommies and daddies, but it is very pg and would go over a younger kiddos head. This is a fun story. I love at the end that he involves others to help him instead of the typical "I have to do this myself and then find out I should have asked for help." My teenager also enjoyed this short read because of the cool, but humble main character. I would recommend this book for third and fourth grade, especially reluctant readers. Personally I didn't really like this book compared to the other books that Gary Paulsen wrote. Because I didn't think that all the stuff he was saying was not really imaginable because it was kind of unimaginable because there was not to much action coming into the story. But this book was about a kid named Lyle Williams being cool to other people around him. My Book Club of students loved the book and all said they'd recommend it to a friend. For me, as an adult reader, it wasn't one of my top reads haha, but I would definitely use it again with another student group. This book is very funny. The carefully spun story of the multiple mysteries at Mudshark's school kept me hooked. mudshark was a good book.Its was a good mystery. How on earth did this book ever get published? Funny. But so bizarre. Funny ending. I think this book was ok but it was not my favorite. Running away from home at the age of 14 and traveling with a carnival, Paulsen acquired a taste for adve Although he was never a dedicated student, Paulsen developed a passion for reading at an early age. After a librarian gave him a book to read--along with his own library card--he was hooked. He began spending hours alone in the basement of his apartment building, reading one book after another. “She was brilliant and joyous and she believed- probably correctly- that libraries contain the answers to all things, to everything, and that if you can't find the information you seek in the library, then such information probably doesn't exist in this or any parallel universe now or ever to be known. She was thoughtful and kind and she always believed the best of everybody. She was, above all else, a master librarian and she knew where to find any book on any subject in the shortest possible time.